Image caption Frankie Macritchie's family said the "wonderful" nine-year-old boy "will be so very missed"
The family of a nine-year-old boy who was killed in a dog attack have paid tribute to "a cheeky boy who had a very special heart". Frankie Macritchie, from Plymouth, died after being attacked by the dog at a caravan park in Cornwall on Saturday. His family said he loved "watching movies cuddled up with his mum and riding around in dad's car with his cool shades on". Devon and Cornwall Police are still investigating how Frankie died. In a statement released through the force, Frankie's family described him as "a fighter from the minute he was born". They added: "He loved trampolining and feeding lambs with his cousins, eating chips on the seafront, and sleepovers at all his aunties' and uncles' houses. "Our wonderful little Frankie will be so very missed by all of his family with every breath that we take." The family thanked police, medical and holiday park staff, and members of the public who came to Frankie's aid. A team of psychologists has been helping pupils at Riverside Primary School in Barne Barton, Plymouth, where Frankie was a pupil. Head teacher Brian Jones called him a "happy laid-back character" with a "great sense of humour". 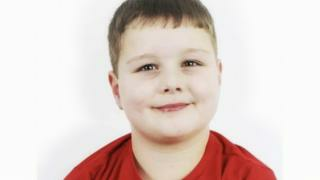 Police said Frankie had been left alone in a caravan while adults were in an adjoining caravan. They were called to the holiday park at 05:00 BST on Saturday and found Frankie "unresponsive". A woman described by police as a family friend was later arrested at a railway station near Plymouth. The 28-year-old, held on suspicion of manslaughter and having a dog dangerously out of control, has since been released.